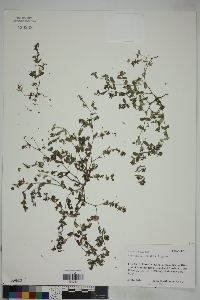 Chamaesyce serrula (Engelm.) Woot. & Standl. Plant: Prostrate to ascending annual forb; herbage pilose, with milky sap Leaves: leaves opposite, inequilateral at base, with serrulate margins, sometimes with red along midvein Flowers: flowers monoecious borne in cyathia; petaloid appendages white; ovary and capsule glabrous, ~2mm long; seeds smooth.